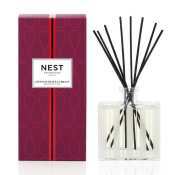 Voluspa Seasons 9.5oz Color Glass Aromatic Reed Diffuser - Truffle White Cocoa. Creamy Champagne, Chocolate Truffle Rolled in Decadent Butter White Cocoa. Experience Voluspa fragrance in a whole new way. Introducing the Seasons Collection fragrant oil diffusers. A custom designed bottle elegantly scaled to fit perfectly anywhere. Form and function come together in a unique and exquisitely fragrant design. if if loved it any more i would almost be embarrassed. The Voluspa Diffusers-Truffle White Cocoa when properly maintained, will fragrance your room for months with minimal amount of maintenance. Follow these simple instructions:. Sign-in or Create an Account to earn 240 points for this item. See Rewards Page.